Everyone loves The Write Place! The rain was drizzling outside when sounds at the back door of the Media Center caught our attention. Mrs. Cindy Tardiff (Kindergarten teacher) and custodian, Mr. Frank Manuel, came through the door bearing gifts from Salisbury State University - twelve 386's for our KIDLINK Lab of all donated computers. It was Christmas in February! It didn't take us long to reformat the hard drives and with the help of Mrs. Joyce Perdue, Mrs. Betty Ryall and Mrs. Carla Hurchalla (Title 1 teachers) we had DOS and Windows installed in no time. The students were eager to use their new computers. Each of the SSU computers now has Netscape installed on it so that the students can make web pages and see their pages locally even though these computers are not really online. 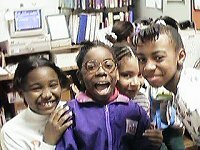 At recess time the students usually run to the KIDLINK lab because there are only so many computers for them to use. With these recent donations the total in our lab is now 25. The students have realized that they don't have to run anymore. Well, maybe. The word has spread that we have more computers and now more students want to join the action! Our greatest joy is that now we can bring a whole class of students into the KIDLINK lab to practice their writing skills. We like to think of our computer lab as the "Write Place" to be. Many, many thanks to all these people at Salisbury State University who have helped our dreams come true - more computers in our lab. Many grateful hugs to: Dr. Phillip Creighton, Dr. and Mrs. Robert Tardiff, Mr. Jerry Waldren, Mr. Ken Kundell, Mr. Greg Tull, Mr. Dave Duitscher and Ms. Marie Neal. Thank you so very much for the new computers. there are a big help to us because a lot more people can come down. Mrs.Tardiff has my brother . My name is brittany. My name is Lauren and I'm in the 6th grade. Every morning I go down to Kidlink with Miss Weeg! We were just getting ready to thank all the people that sent us the new computers and she said,"I forgot the names of the people that gave us the computers at home!!" She said that I could write to you and you could help me!!! Please write soon because alot of childen want to write to them and who do we write to?? HELP!! Hi, My name is Tiffany and I would like to thank you for all the computers. We like to get new computers because alot of kids come to Kidlink. And once agian thank you for all the computers. Bye!!!!!!!!! Thank you for all the computers that you gave us . We used the computers for making web pages also for mailing letters in every country maybe we could type to you sometimes what do you think? I think that would be so cool. Thank you for all of the many computers that we recieved from you. They are all nice. We are having alot of fun with them. They have many things on them. I mostly wrote you to tell you that we appreciate the computers!!!! Hi! my name is Vanessa. I am writing you a thank you letter for all these computers. I love them. It makes coming to Kidlink a lot better. Now I don't have to worry about coming on my letter day. We had letter days to come so it wasn't too crowded. Now we can come when ever we want. Thanks A lot!!!! Bye!! 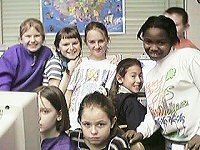 Thank you for giving Delmar Elementary the many computers. We will enjoy them. I have made over 6 web pages on computers, so check them out!! !If you check the Global Classroom you will see me with my friends. I love working on the Internet. THANK YOU FOR GIVING US THESE COMPUTERS!! WE ARE MAKING WEB PAGES AND YOU ONLY CAN SEE IT ON CERTAIN COMPUTERS. SINCE YOU GAVE US ALL THESE COMPUTERS AAALOT MORE PEOPLE CAN SEE THEM!!!! WE ARE SO HAPPY NOW THAT SOMEONE DOES NOT BOTHER YOU SO NOW WE CAN WORK ON OUR COMPUTER!!!!! HEY, IF YOU HAVE ANY MORE COMPUTERS WE COULD USE THEM!!!!!!!! BUT BACK TO THE WEB PAGES. WE CAN PUT PICTURES AND ALL DIFFERENT KINDS OF STUFF ON THEM. WE ALSO WRITE TO PEOPLE AROUND THE WORLD. IT IS REALLY FUN!MAYBE YOU CAN COME DOWN AND WATCH ONE DAY. THANK YOU VERY VERY VERY VERY VERY MUCH!!!!!!!!!!!!!! Hello, my name is Lisa from Delmar Elementary School. I would like to thank for donating so many computers. Right now we are making web pages and writing to you and people in Sumatra. We also keep in comtact with many other adults and kids around the world. Thanks to you donating we are able to hold more students at recess and after school on Wednesdays and Fridays. Before we had to turn away kids because we were not able to hold a large quantity of students. Thank you for giving us 12 computers we really needed them . Hi, my name is Malinda. I wanted to thank you very very very very very much for the computers.!!!!!!!!!!!!!!!!!!! We have be making Web Pages in Kidlink. Thank you for the computers. We needed them very badly. We appreciate you for the computers. Now we don't have to worry about taking turns coming to Kidlink. Thanks A lot. Good- Bye!!!! Thank you for the computers. Thank everybody else too. I know this letter is short. Maybe I will write you another one. Hi my name is Lori. I just want to say thanks for the computers. I thought it was a nice thing to do. Well I just thought I would thank Dr. Phillip, Mr.Jerry, Mr.Ken, Mr.Greg, Mr. Dave, Ms.Marie. Thankyou for giving us the computers. We really needed them, so now everybody can come to kidlink. We would like to thank the people in your school . Me and my friends had to run down stairs to get to the computers. Now that SSU gave use the computers we can walk. Thanks for the computers. We are using them right now. They work well. Thanks again! Thank you for the computers!!! Now we can write to people around the world!!!! How are your classes???? Mine are okay!! what is your favorite class???? Mine is Math!!! Any way thank you for them!! bye!!!!!!!!! !